The California Department of Water Resources (DWR) is working to increase agricultural water use efficiency here in California. DWR is funding our research on the effect of biochar and compost on crop water usage. We have set up three research sites, one in the Central Valley, one in the Central Coastal Rangest and one in the Desert. Sensors will be set up at each of these sites to monitor water use over the growing season. In March, biochar and compost were laid down in a random block design in a field at Terranova Ranch. The treatments are: control, compost, biochar, biochar + compost. In April, the field was planted with processing tomatoes. In early May, the watermark sensors were installed at 1 and 2 ft. depths in each plot. The tomatoes at Terranova Ranch were ready for harvest in the second week of September. Terranova Ranch kindly agreed to help harvest our plots. At the same time, all the watermark monitors were removed (to prevent damage) and the watermark sensors were unfortunately lost. 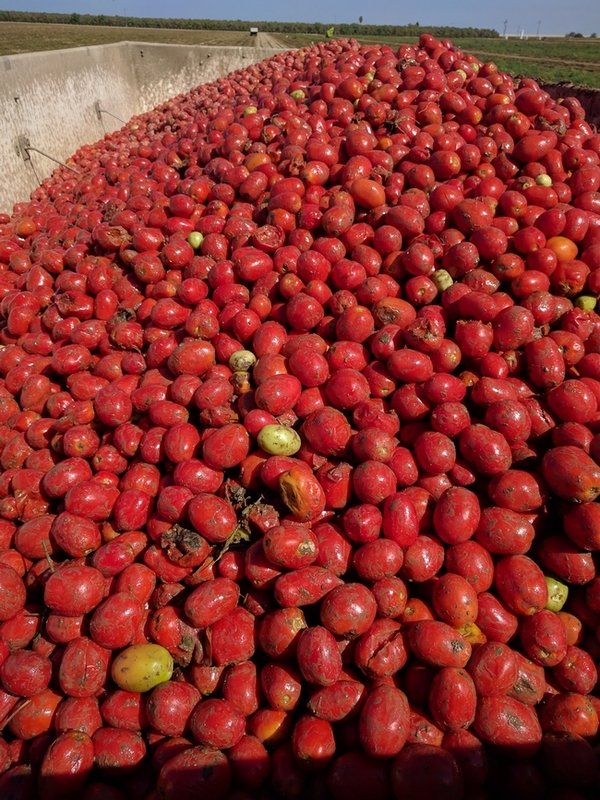 Following the tomato harvest, Terranova Ranch is leaving that field fallow until next Spring. The Tule sensor will probably be installed in March around the time of harvest to allow for the greatest amount of use for the Ranch. Preliminary results suggest that the biochar had a negative impact on tomato yield. Plots with compost application yielded 2% more paid weight of tomatoes than the control plots, while plots with biochar had 5% less yield, but the application of compost to the biochar plots recovered the yield to being almost the exact same as the control plots. The installation of the watermark sensors at Monterey Pacific has been delayed until the next rain. Soil samples will be collected when the sensors are installed. In December 2016, three biochars from Cool Planet, called CP001 and CP002 and CP001M, were laid down at DREC. Treatments include: treatment 1 (1.7 t/ha of CP001), treatment 2 (3.4 t/ha of CP001), treatment 3 (1.45 t/ha of CP002), treatment 4 (2.9 t/ha of CP002), treatment 5 (2.75 t/ha of CP001M), treatment 6 (5.5 t/ha of CP001M), treatment 7 (11 t/ha of CP001M), treatment 8 (50 t/ha of CP001M), treatment 9 (100 t/ha of CP001M), and treatment 10 (150 t/ha of CP001M). Each treatment is replicated 5 times and each plot is 22 x 200 ft for a total of 5.14 acres. Sugar beets were planted in mid-October and the Watermark sensors were installed in late October. Previously, wheat was grown in this field. Data from the field shows that although adding biochar to the field (any type or amount) caused a significant reduction to the yield, increasing the amount of biochar improved the yield. We are still working on figuring out the cause of this unusual response.